Uses: Utility – meat and eggs. Useful autosexing characteristic. Weight: Gander: 7.3 – 9.1 Kg. Goose: 6.3 – 8.2 Kg. Colour: Ganders: White. Geese: Pied Grey and White. Useful to Know: An autosexing breed. Photo: West of England Goose, BWA Best of Breed at the Poultry Club National 2009. West of England Geese (like Pilgrim Geese) are an autosexing breed. These two breeds are the only true autosexing geese that can be sexed at hatch. 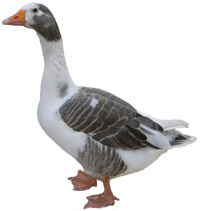 Ganders are white and geese are grey and white. Both goose and gander have a slightly pink-orange bill, legs and webs. The West of England Goose was first standardised in the UK in 1999.